Brighten up the work day with our long-awaited lighting range, which has just landed at Zenith Survey. Adequate and suitable lighting, including emergency lighting, should be provided in all circumstances where safety and precision is required. Effective lighting is paramount for safe working practices and project efficiency, we are dedicated to offering not only quality equipment for minor works, but also full support in large volume applications like major projects at refineries, chemical plants and power stations. Here is a handy guide for our eagerly anticipated lighting range. 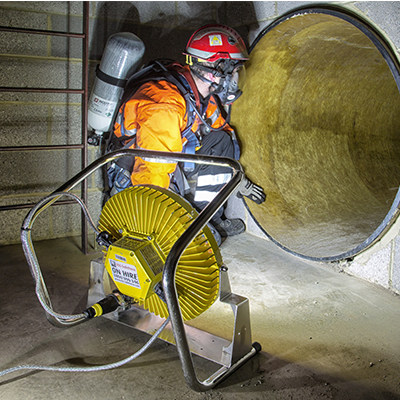 When working in areas such as confined spaces or industrial sites, efficient and up-to-date equipment is a must. Lighting the way to better equipment is our range of handlamps and torches, ATEX approved, high strength and robust portable lights that are imperative aids in low-visibility areas. But which torch do you need for your project? 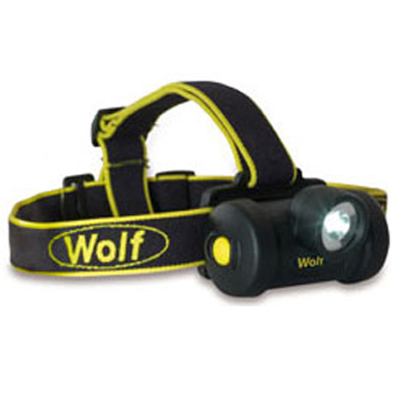 The Wolf ATEX LED HT-650 Zone 0 Headtorch is the ideal high light output and long duration headtorch for hands free lighting, particularly where access is difficult and requires climbing or crawling. With a 'Fitted for Life' high power LED light source, the HT-650 has a powerful light output of up to 130 lumens with an optimum light duration of approximately 17 hours from a set of three AA alkaline cells. The use of primary cells makes it economical for personal lighting. The HT-650 is CE marked to the ATEX Directive and IECEx certified for safe use in Zones 0, 1 and 2 potentially explosive gas and Zones 20, 21 and 22 dust atmospheres. The tilt adjustment mechanism allows the user to angle the light and the bespoke optics deliver a broad spot beam suitable for close up hands free tasks, ensuring that this handy headtorch is perfect for any project that requires complete focus. 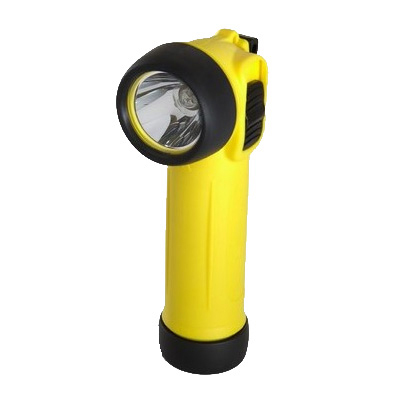 The Right Angled ATEX Safety Torch is a reliable, simple and cost-effective portable light, available with a straight or right-angle body style and vacuum or xenon bulbs. This compact torch has a certified IP67 enclosure, ensuring it is securely sealed, dust tight and protected from water immersion. Owing to the torch’s carefully selected thermoplastic resins, it offers high strength with excellent chemical resistance and proven impact resistance – even at sub-zero temperatures! The rubber armoured lens ring and end cap give enhanced grip and shock protection, in addition the lens is scratch and chemical resistant, making this the ultimate tough companion in low visibility areas. The T4 model delivers outstanding light output using advanced, long life xenon bulbs, set in a high quality parabolic reflector, coupled with alkaline cell approval, giving up to 12 hours of light output. Alternatively, the T6 model allows use in any Zone 1 or 2 atmospheres, with optimum light output in this temperature class and a 5 hour duration. Both models allow safe use in Zones 21 and 22 dust atmospheres, with certified maximum surface temperatures of 65°C or 95°C. The ATEX Rechargeable LED Handlamp from Wolf is a high performance, lightweight and compact handlamp for safe use in Zone 1 (Gas) and Zone 21 (Dust). Its high powered LED light delivers a piercing beam that floods through the darkness, giving a peak of 200 lumens light output. This first-rate handlamp is lithium ion battery powered with 6 hours duration at full power and 12 hours at half power and comes supplied with a standard 230V charging cradle (non ATEX), which gives a maximum 3.5 hour recharge time. Its long battery life ensures project efficiency allowing personnel to focus on the job at hand without worrying about loss of visibility. Our intrinsically safe Floodlamps and Worklights are designed for use in hazardous areas to remove the risk of sparking that may cause explosions or fires in flammable conditions. These challenging environments need capable lighting that is CE marked to comply with applicable ATEX directives, as well as being water and dust tight. Take a look below to discover which lighting equipment is the ideal solution for your project. The 10w Portable LED Worklight is compact, reliable and delivers an excellent performance. Ideal for providing scene and work lighting without the need to provide a separate power source. Scene lighting can be set up in seconds by a range of end users such as builders, surveyors and tradesmen. This robust worklight comes with attachment clips that are quick and easy to affix to tripods, making it perfect for use in confined spaces. The Portable LED Worklight comes in both 10w and 20w editions, delivering an outstanding performance at a budget. 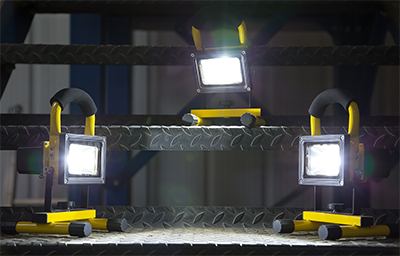 These tough worklights provide cost-effective lighting for virtually all work sites and are particularly useful in harsh, remote applications for extended periods. 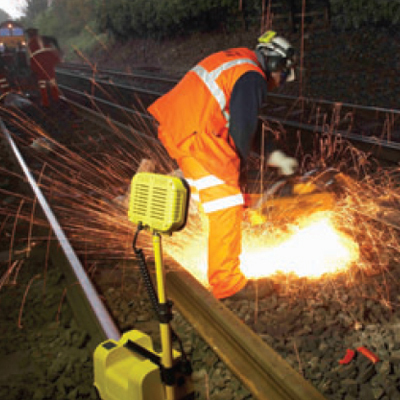 The Rechargeable LED Single Head Floodlight – Peli is Network Rail approved and easily deployed to deliver high intensity lighting without a separate power source. This powerful floodlight even won ‘Highly Commended’ in the Network Rail Innovations Award, so users can be rest assured of its quality! The floodlight suits remote environments where power is not available or noise sensitive environments like urban night working where a generator will disturb residents. It also reduces the risk of manual handling and avoids the trip hazards from trailing power leads. With a high-powered light output of 1000 lumens (economy) or 2000 lumens (high) through 24 high magnitude LEDs and a long battery duration, projects won’t suffer from lack of lighting and the job can be completed with speed and efficiency, whatever the time of day. 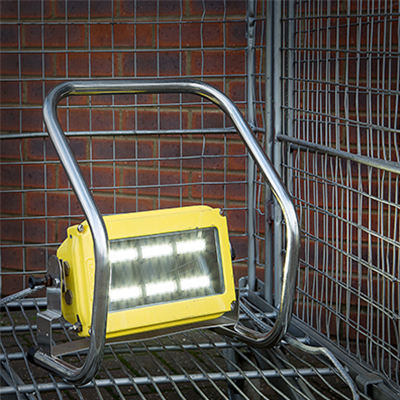 The Dialight ATEX LED Floodlamp is suitable for use in Zone 1 and is capable of being linked together as a group. The light is rugged in design and has an Ingress Protection rating of IP67, ensuring it is protected from dust and water. This Dialight Floodlamp has an incredible light output of 2250 Lumens and comes supplied with a standard 10m input cable with an EX rated plug and coupler, providing plenty of light without loss of performance. The ATEX LED Floodlamp from Wolf is a high performance, lightweight and portable floodlight for safe use in Zone 1 (Gas) and Zone 21 (Dust). It has 110 and 230 available voltages depending on your requirements, with a strong light output of 58w. This floodlight is supplied as standard with a 20m supply cable, giving plenty of scope to manoeuvre the light around the work area. With an Ingress Protection rating of IP67, it will provide competent lighting with extreme protection. 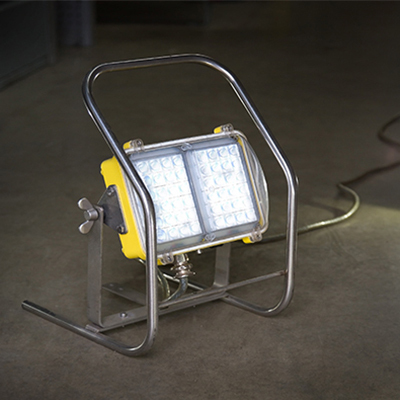 The ATEX High Output LED Zone 1 Floodlamp is portable and designed for lighting large areas with a clear white light. It boasts longstanding protection against the elements in the harshest environments with its IP66 Ingress Protection rating, and is approved for ATEX Zones 1 and 21 and ATEX Zones 2 and 22. 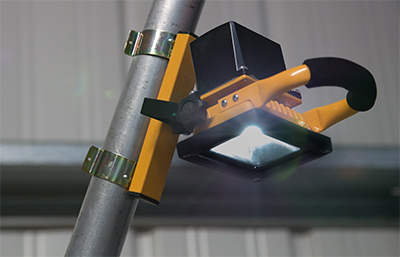 These extremely bright floodlamps are capable of being linked together, and with its 9500 lumen light output, vast work areas will always be covered with high intensity lighting. 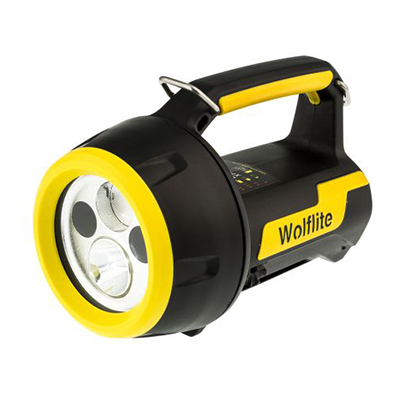 The Wolf ATEX Zone 0 Floodbank System exploits the excellent performance and reliability of the Wolflite XT Rechargeable Zone 0 Handlamps to deliver collectively a flood of outstanding illumination of up to 2,100 lumens to a Zone 0 hazardous task area. Available in two, four or six handlamp bank configurations, the stands can be placed on level ground or mounted on a tripod (available separately) to elevate, direct and focus the light to the desired working area. The bespoke optics coupled with the highest performance 'Fitted for Life' ultra-bright LED light sources deliver an outstanding light output. With spot and flood switchable beam options, a built-in state of charge indication for each lamp and up to 6 hours (full power) or 12 hours (power save) duration, these robust floodbank systems are sure to deliver the ultimate performance on a variety of work sites. Whatever your lighting requirements for a project, Zenith Survey are always available to advise and support. To see our full hire and sales lighting range click here, alternatively call 01924 263 346 or email Zenith-Survey@vpplc.com for more information.